We're always being asked on specifics for dietary advice and what extras we do. So here's our summary of what to expect for food at our event. Note this depends on availability so in the unlikely event (its not happened yet) we can't get a product we'll replace them with something similar. Basic package birthday parties - 1st course marshmallows in chocolate/caramel biscuits, followed by sausages in buns (for kids) and bacon in bread (adults). Then we finish on popcorn cooked in salted butter. We cater based on the no. of children that have booked so if you think extra siblings may turn up we advise booking for them too so there's enough food. Any extra we hand out to parents so its not wasted. Vegetarian advice: We can swap out marshmallows for malt loaf. Sausages for kids and bacon for adults is replaced by Quorn hot dog sausages. Vegan: We use Aldi malt loaf which vegans are telling us is suitable (unlike Soreen). Instead of Quorn we'll do Linday McCartney (soy) sausages. Nut allergy: None have nuts in but chocolate biscuits may contain traces so go for extra marshmallows. Wheat/gluten: Avoid biscuit smoors and go for extra marshmallows. Don't try malt loaf as it has wheat in. Sausages contains breadcrumbs with wheat. Obviously bread does too. So go for some bacon on a stick (feel free to bring your own gluten free bread that you find works for you). Let us know if you'd like a quorn sausage on a stick (NB Linda McCartney sausages have wheat flour in so avoid them). Dairy: Avoid biscuit smoors and go for extra marshmallows. We cook our popcorn in butter (mainly because it pops well) but we can do some over the fire in sieves which is additive free and quite interesting to watch - just let us know. Pork free: Our marshmallows specify gelatin but not pork or beef. Halal families have told us they've checked and its OK but we can't verify that - failing that try the malt loaf toasted instead which is nice. Go for a veggie sausage instead of pork sausage or bacon. From time to time we do special events with these items or birthday parties book extra for a small charge. 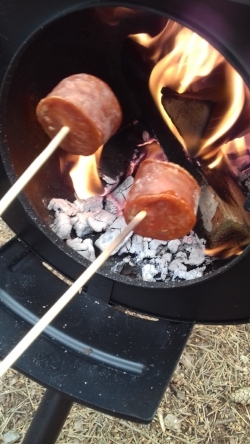 Chirizo on a stick - Spicy Pork Sausage toasted on the fire like a marshmallow. Intended for attending adults but kids can try. Banana chocolate fondue - Steamed chocolate sauce melted over the fire. Dip in banana halves or any left over marshmallows. Sickly, sweet and messy. May contain nut traces. Contains milk. Let us know if you prefer Nutella - which obviously contains nuts. Toasted chocolate brioche fingers - cooked on a long stick over the fire. (contains wheat, milk and potential for nut traces). If you'd like to book extras or you have a specific allergy or dietary requirement just get in touch. This information is correct at the time of publishing so contact us if you think information might have changed or you have any concerns. Thanks! We're looking to recruit a forest school assistant to help out with our forest school taster events and birthday parties. This is ideal for someone who has another job or wants to work on an ad-hoc basis. Our order book is variable so we need someone flexible who can work at weekends as required. This is great for someone who wants to get into Education, Youth Work, Outdoor Ed or Forest Schools. You will be responsible for helping a forest school leader set up, run and pack away a forest school session. Set up and packing away requires a significant but manageable amount of lifting and carrying. You will set up a fire area, tarpaulins, toilet, hammocks and other play equipment or activities under supervision. During the session you will interact with children, parents and members of staff. You will build and light a fire, manage groups around the fire and use it to cook on safely. No bad weather just bad clothes? Well apart from extreme weather such as dangerous wind of course. We list our top tips on how to get the most from a fairy forest school event or outdoor party over Winter. So you've got the invite to an outdoor forest party or you've just booked on to an event over winter such as our elf adventure. Hang on you tell yourself - isn't it going to be cold? What if its raining? Here's what you need to do to make the most of our events. You're here to have fun not get cold! When you book on or get an invite you'll know which wood you're going to be at. We operate in a range of woods some with hard wearing paths and others with pits of mud and even a stream. Lumb Brook Valley aka the Dingle has some deep mud (i.e. welly sucking) and a stream. There are dry routes but to get involved you're likely to be in the stream and mud. The loo is also only accessible by crossing a stream. Gorse Covert Mounds has good paths. After rain there's the odd puddle and near base camp there's a bit of a muddy patch which boots can easily cope with. New Moss Wood has turf paths and some patches of mud that can lose a small welly. After rain it can get muddier here and there. Snidley Moor has puddles and mud where we park on the farmers track but for the most part is pretty well drained and mud free. There's the odd patch though that boots can easily cope with. You can find out more about our sites here or visit them yourself to check them out as they're open to the public. Check you've got the right kit and is it OK? Wellies that don't fit or have perished or split. Waterproof coats with broken zips. Jackets or trousers that don't fit anymore. Clothes don't need to be expensive but they need to do the job. Don't leave it til the morning of the party or event. Get dressed in layers. Your base layer is something tight and stretchy like thermals that you're unlikely to need to take off. Then add more layers and leave something thick until last. Over the top its waterproofs - these keep out a cold wind and rain (or stream splashes). If you get too hot - take a layer off, if you get too cold put a layer on. If you want to get ahead - get a hat (and maybe a scarf too). Lots of body heat is lost through the head and neck. So if your hands and feet are cold, put your hat on. Gloves are a pain. They are hard to get on children with their tiny fingers. They can get wet (and are then useless). Some activities such as fairy house making are too fiddly for gloves. We advise mittens where fingers warm each other and if you do need to do something fiddly take them off then put them back on when you've finished. Of course on a really cold day you could do inner gloves and then mittens which are great for our hunts and less dexterous tasks. Rubber wellies don't keep your feet that warm especially if you're wading in a stream or mud. Go for larger size wellies and pack them with layers of socks (or fleece welly liners if you have them). TIP: Have emergency pairs of socks in your pockets in case of a wet welly or use them as an emergency mitten. Put a back of extra clothes in the boot of the car for you and your family. This is handy over winter anyway in case you break down and why not put a blanket in there too. Chances are you won't need it but you'll be thankful if its there. You can dip into it if needed or do a complete change for the journey home. A good breakfast being digested produces body heat and sets you up for the day. We have food at nearly all our events but bring snacks to top up tummies or have just in case. Grab it whilst its hot! We have hot water in flasks prepared for the start of every event. Help yourself to tea, instant, coffee or hot cordial. We've cold water too so you can get it to the temperature you like. When our wood burning stove is up and running we serve hot chocolate and freshly percolated coffee too. This is usually at food time so about an hour in to the session. Bring your own thermos as well if you like (even if you leave it in the car). Pour it and nurse it if your hands are cold. A hot drink in a plastic cup is a nice hand warmer that you can sip. We prepare food on the fire and when its done its done. Don't hold back or start another activity - grab it whilst its hot. TIP: We often cook extra food just in case so we often have left over sausages. If you're an adult you're welcome to make a play for any left overs before we start cooking the parents' food. We want parents to get involved and have as much as the kids. Moving about and having fun keeps you warmer than standing still and holding back. We love wading through mud on our adventures and so do the kids and parents. But if you're cold and not dressed as well as you could be then maybe you should give it a miss or do it towards the end of the session. There's nothing that says you have to go in the mud. The same goes for the stream at Lumb Brook - although the loo involves a small stream crossing. There is a dry path when we go exploring although we encourage you to do the wilder stuff but its down to you to decide how you manage risk - that's what forest school is all about. Wear the right clothes and you're ready for all weathers. But if you've misjudged it then maybe now's the time to get under one of our overhead tarps and have a brew until the shower passes. On cold days we dust off our emergency kits and encourage people to use them. This includes plastic bivvy bags and a group mushroom shelter. It doesn't have to be an emergency to give them a go. They're great fun. Try them - you might want to get one for when you're out and about somewhere else like up a hill or on a day walk. Make sure it has a cover! The soft toy ones are quite good and you'll be really popular if you start handing this around on a cold day. When it starts to cool we can replenish it with hot water from our wood burner. OK so you've lost a welly to the mud and your little ones cold. There's no shame in nipping back to the car to get changed and get warm. Get comfy then come back replensihed for more fun. We've just had a weekend of booked Forest Birthday Parties. The same weekend as storm Brian hit the UK. The lead up through the week has been one of communicating to the parents with the possibility of a cancellation and re-assurances that we're checking the weather. On Thursday we advised parents to look into the potential for a Plan B after the forecast was fairly sure the storm would hit. By Friday morning it was looking like Saturday pm was when it was most likely the storm would hit and we agreed to cancel the birthday party. We offered another date or a full refund. Luckily with enough notice the family managed to get in a soft play for the afternoon so they went with a refund and a couple of complimentary places on our upcoming Nov 5th event. We offered the same to the family booked on in the morning but they were willing to take a chance on an on-site assessment of the wind on the day. Come Saturday morning we arrived on-site and started to assess trees on site - there had been an earlier windy storm in the week -and also assess the trees near where we operate in as usual. The standard for umming and ahhing about if you should be in the woods on a windy day is Beaufort level 5 or less if you have poor trees. Lumb Brook Valley was fairly sheltered so some mature trees were barely moving which was re-assuring as on the drive over there was significant swaying of trees in more exposed locations. The forecast predicted the storm increasing with regional winds from about 40mph at appox. 3pm by which time we'd be long gone. When the parents arrived we agreed to a slightly more intense forest party than usual. We were going to forego our free optional chill out 3rd hour to make sure we beat the storm and could pack away. We also agreed to stay within areas of the wood we had just checked for tree damage (such as hanging branches). Our 3 regular identified dodgy trees were avoided and zoned off as usual - these have a significant leans, hanging branches and dead wood at height. All was good. We packed up and got home well before the stronger winds came. The forecast for Sunday was looking better too with the gales diminishing to a strong wind over the course of the morning. Come Sunday afternoon there was still a reasonable wind and some sway of younger trees in the woods at Gorse Covert Mounds. We spent a good hour of assessing trees looking for hanging branches. This included shaking young but dead trees or branches near paths or areas we might go through or near. About 4 of these we got onto the floor - the rest were strong enough to be left alone. What's handy for us is that a lot of Gorse Covert is fairly open so we extended our fairy tale hunt so the 1st hour wasn't under cover giving even more time for the wind to die down further before getting to our woodland base camp. By the end it was pretty still and a sunny Autumnal evening and everyone was raving about a great party. For a quiet moment - on my own - packing up I took a few short minutes to reflect. My thoughts are that its good to experience wind in the woods, the swaying of branches and the hiss of leaves. There's also that part of me that worries, sometimes needlessly- are the trees safe? Will everyone be OK? That niggle makes sure Fairy Forest School safety value is met. I was asked today about lighting fires in woods when its dry. This is a legitimate concern so here's everything we do to make sure we're safe and legally compliant. 1) PERMISSION. We have the written permission of the land owner. For the woods we operate in this is the Woodland Trust. They do not allow fires on their land and can pursue those that light fires for criminal damage. We have a licence agreement which is regularly reviewed with the Trust's site manger. The licence requires agreed working practices, risk assessment, environmental impact assessment, public liability insurance and certification of competency. 2) OFF THE GROUND. Soil (especially organic loamy or peaty soil) can burn and be extremely hard to put out. We use a fire pan and in extremely sustained dry weather use a stove which is even further away from the ground. Mineral soil such as sand can be placed under the pan or other materials such as green logs if its dry. The ground is doused after the fire and if dry before too. Any sticks that fall out are placed back in the pan. 3) WATER: We bring copious amounts of water to douse the flames and surrounding ground. Fresh tap water can also be used to immediately treat a burn before applying burn gel. 4) ZONES: We zone off the fire with our hot zone triangle. You are not allowed to put bare skin in here - only if its holding a toasting stick or wearing a fire glove. Our next zone is strictly no running and deemed as the approach area to the fire. 5) CONTROL: We can control a fire in our pan by smothering it if we want it to be on hold for a while. A fire pan limits the size of the fire as does restricting the amount of fuel added. We never leave an active fire as it should be constantly managed. 6) EMERGENCY PLANNING: Forest School Practitioners have current first aid training - at our disposal we have clean tap water, sterile water, burn/hydro gel and cling film to cover and keep clean any burn. We have prepared emergency procedures which include fire. We have a fire blanket nearby and kit to smother a fire in addition to water. 7) COMPETENT: Forest School level free training includes managing and handling a fire. I also have numerous experience in handling fires including fire awareness and extinguishing training, science teacher - combustion, bunsens etc, wood burner at home. We were also lucky enough to have a pupil's father attend our forest school that happened to be a fire officer. He helped advise, experience and inform how we handle fire too. 8) PERSONAL PROTECTION: We use fire gloves, have a fire blanket, have water on hand, and first aid equipment. We ask parents to remove any costumes that children occasionally come in (such as fairy wings) as we're unsure as to their flammability. 9) LEAVE NO TRACE: The fire pan prevents ground scarring. The ash/ember soup once doused with lots of water is either spread around by hand (where we check its cold) to fertilise our favourite trees with potash or early on in the year we take it away, dry it and use it as charcoal once its dry. We scatter or take away any piles of collected fire wood we have to put off illegal fire use. 10) COMMUNICATION: We share with our customers what we do. We want people to be put off lighting illegal ill-considered fires in woodland and tell them the consequences of what can happen to them (burns, fines, imprisonment), others and the environment. When we spot ground scarring we report it to the site manager, other volunteers or friends groups and to the police. We consider what we do as best practice and share that with others and listen to any hints or tips from other parties to make what we do even safer, more efficient and better for the environment. Our regular forest school in its current format is coming to an end. Its been brilliant doing a regular forest school that rolls on through the seasons at Lumb Brook. We've made new friends and helped share our love of nature and forest school. However our 6 sessions for the price of 5 offer which permitted customers to skip sessions and pick them up later, coupled with moving the sessions to a Tuesday because of teaching commitments means we've reached an unsustainable level of uptake especially in term time and in the week. We've had lovely quiet sessions which often means children get near to one on one attention however from a financial perspective these regularly make a loss and can't be borne any longer. These quiet sessions sometimes lack the social interaction which makes forest school what it is too. To make matters worse forest school always takes a dip in uptake during Winter as the weather gets worse (although we like wind/rain and snow) and people are a bit hard up from Christmas. To remedy this our prices have risen to £6 per child (a marginal increase of 50p) and we're only accepting group bookings of 6 or so we always have a minimum number. That way we make a baseline revenue to cover costs and get the interaction we need. This is still a bargain at just £36 for 6 kids . Our regular Tuesday sessions will end on 8th November at Lumb Brook Valley before we take a break over Winter. We'll be reflecting on what we think works and decide what to do for Spring 2017. DON'T BE SAD! We are still offering individual events such as our bear hunts, dens etc on selected dates. If that doesn't scratch your forest school funny bone we can still do private sessions/programmes by arrangement (well worth it if you think you can get a large group together). And of course we're carrying on our work in schools and trips to our woods. Still got some sessions due? DON'T PANIC! As per the terms and conditions of this great offer the regular forest school sessions will be carrying on for the next six weeks giving you ample time to use any outstanding tickets. Please let us know you're coming. We'll be on site but with no bookings will be concentrating on doing voluntary work for the woodland trust. If you're in doubt as to where and when check out our events on facebook or get in touch. Its been full on mad busy. And we've more on over Easter. Our Friday Forest School carries on from strength to strength and we now have a dedicated page telling you about it here. This is great for toddler's preschoolers and home ed (as it runs every Friday even term time). We're carrying on with our holidays outdoor events which for Easter is a fairy tale nursery rhyme hunt for soft toy characters before hitting base camp where we'll be making our creatures homes and dens. Incidentally our base camp know has a scramble net as well as the usual camp fire and hammocks. Food is a chocolate laden meal with all sorts cooked on the fire. We're sticking to our usual MONDAYS Lumb Brook, TUESDAYS New Moss Wood and WEDNESDAYS Gorse Covert Mounds. Our forest schools here. We've deliberately left Thursdays free so if you're a holiday club wanting to book something then get in touch. The last Sunday of every month is when we put something back into a local wood that needs some TLC in Birchwood Warrington. This month that happens to be Easter Sunday so join us if you fancy a break from all the chocolate. This is a FREE event and designed for adults but children welcome. Just turn up at the Walled Garden in Locking Stumps at 1pm - 3pm. Its conservation work and tidying up with tools and equipment provided. Please feel free to bring your own but no power tools thanks. We call it Love your Local Woods.